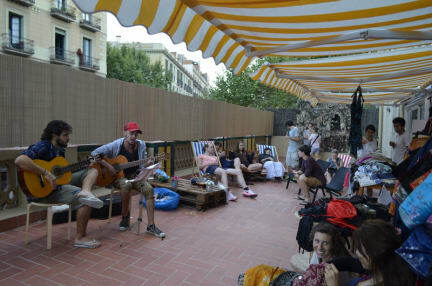 360 Hostel Barcelona Arts&Culture kohteessa Barcelona, Espanja: Varaa nyt! Welcome to 360 Hostel Barcelona Arts&Culture, the place to stay if you're looking for a different experience, combining quality and culture. We are only a few steps away from Plaza Catalunya, the charming neighborhood of El Born and the Triumph Arch. Urquinaona or Arc de Triomf metro stations can be reached in less than a 5 minute walk from the hostel. We love our city and we are willing to show you the most special places and events of it! Our international staff at the 24-hour front desk can provide information about the area including best tourist attractions, restaurants, shopping and museums. Check out until 11 AM. I was there a little bit early, but the staff was most welcoming. The atmosphere was relaxed and active. My critique is about one shower having low water pressure and the lockers being under the beds. One girl tore her shirt while climbing in there, and literally what you have to do to get your stuff. Also, the metro goes right under the building, if you're a light sleeper then at least dorm number six is not for you ;-) other than that, a very nice stay.